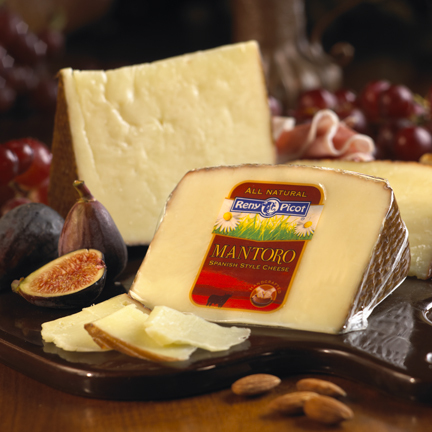 Sweet and salty, Mantoro’s flavor profile varies depending on the age of the cheese, but is generally tangy with a light nuttiness. The lasting sweetness combined with a distinct acidity that tingles as it melts on your tongue creates a cheese that is both a feast for the eyes and the taste buds. 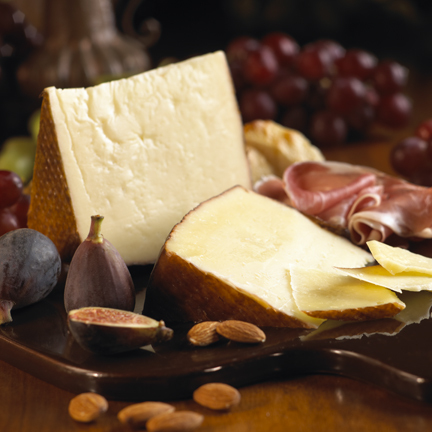 Manchego is Spain’s most famous cheese, which originated in the plains of La Mancha. Old Europe Cheese’ American Mantoro follows the time honored recipes handed down by Spanish generations, with the distinction of using pasteurized cows’ milk. Mantoro is a hard, pressed, cooked, and a beautifully presenting cheese with a hard rind impressed with plaited esparto marks along the sides. The top and bottom have elaborate patterns left behind by the forms utilized in pressing the cheese. The exterior rind of this cylindrical cheese is a beautiful dark brown that complements the firm ivory paste, which is sometimes dotted with small eyes. Mantoro’s flavor varies depending on the age of the cheese, but it is generally salty to slightly piquant with a tingle that melts on your tongue. Ideal storage temperature is 40-45 degrees Fahrenheit. After cutting, one may wish to lightly coat the exposed paste of the cheese with olive oil to prevent drying out. Unused cheese should be wrapped tightly in plastic to inhibit further moisture loss. Some plastic wraps may impart a slight flavor to the cheese so consider scrapping the surface before serving. Always use fresh plastic wrap when rewrapping.